Facts and history about the life and lifestyles of Native American Indians. Definition: A travois was a means of transportation devised by Native Americans who had no knowledge of the wheel. It was simply constructed using two poles that were lashed one on either side of a dog or, later, a horse, with one end of each pole dragging on the ground. A netted hoop or ladder of crossed sticks created a platform to contain the load. The name of this form of Native American Indian transport derives from the French word 'travail' in the sense of the "shaft of a cart". The travois was first hauled by dogs until the late 1500's when the Spanish first introduced horse to the Native American Indians. The life, history and lifestyle of Native American Indians Native American Indians is a varied and fascinating subject. 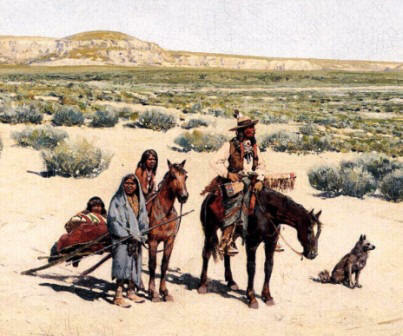 The following fact sheet contains interesting facts and information on the Travois, the important method of transport, hauled by dogs or horses and used by the tribes of the Great Plains. Travois Fact 6: The introduction of the Native American Horse, and its use as a beast of burden, enabled the tribes to accumulate more possessions. Travois Fact 11: Possessions were loaded either straight on top of the framework and secured with cordage made from leather or sinews or placed on top of buffalo hides.